I nearly choked on my Italian stew when one of my relatives, over dinner and without any sense of irony, said, "So you get well paid to play with wires." An incontrovertible fact, which I could not deny. Of course my work as the audio/video editor for the Melbourne Herald Sun and its 2.5 million daily readers was much more demanding than preening or dressing cables. In fact, most of the time it was daunting. Imagine trying to create, grow and attract a sizeable amount of that readership to the esoteric hobby you and I love to share with any prospective convert. From the get-go, our weekly eight-page section supported the hifi specialists whilst trying to provide honest coverage to the mass-market brands as well. Within two years we were established, had a huge readership and Ken Kessler agreed to be our international editor, providing coverage for all the important overseas audio shows. Ken, who I adore as a personality and amazingly gifted writer, loved the idea of a mass readership. "2.5 million" he'd say with anticipation. And I can see Ken's imagination in overdrive as he pondered 2.5 million readers with Radford STA25 driving vintage LS3/5A. Ken delighted in running the Herald's circulation figures past the astounded faces of Quad's new owners. They were debating if a journo in the Australian antipodes should be reviewing Ken's expensive, hardback, definitive history of the Quad Company. The book did arrive. The above is my audio bio. But hardly all of it or the part I regard as the most important to my contributions you'll hopefully encourage me to share with you on 6moons. Like you, my audio journey begins with a significant someone who still means the world to me even though we haven't spoken for a decade. His name, which deserves to be shared here, is, John Hughes. Well prior to my stint at the newspaper, just before John encouraged me to quit clerical work to enjoy nine years at university, we shared an office located in a quaint little lane that was in the neglected quarter of the heart of the city of Melbourne. John was eccentric. And he also had a quality that audiophiles have in bucket loads. That quality was generosity. He was generous with his time and his encouragement, inspiring me to get a formal education and what's more important, develop a love of music and audio equipment. The night that sparked a career in audio began with a system he'd built for friends comprising 15-inch Tannoys driven by the latest Quad 33/303 amplification. 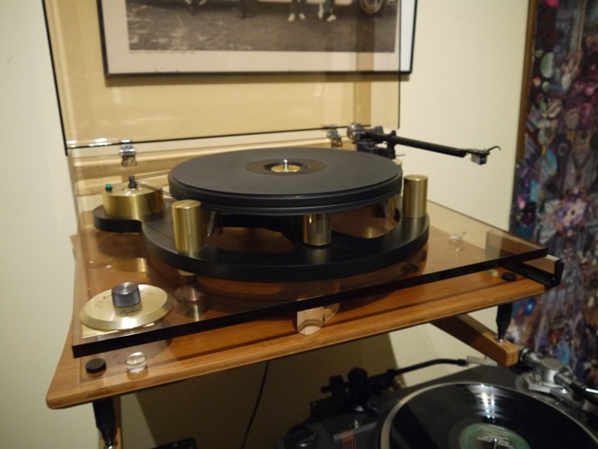 Signal source was a Thorens TD124 with SME3009 tonearm and Shure V15 cartridge. The music that evening was a Bach organ composition. Imagine what that experience meant to a young bloke who'd left school at fourteen to swot in a factory? Here I was with people who drank wine, read books and listened to music on equipment that even I knew then was a universe apart from the radiogram we had at home. This was the good life and I wanted in. Above all, I wanted to meet this music writer called ‘'Bach''. John explained later that the latter might be hard to arrange, given the great man was now God's composer. 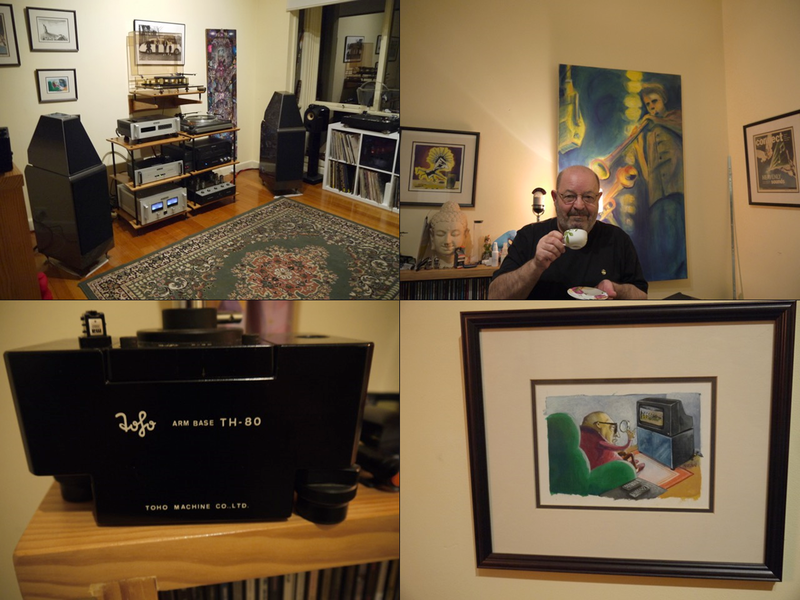 With John's help we bought a Peak transistor amp and Garrard semi-auto turntable. John supplied a pair of detachable speakers that were originally part of a reel-to-reel tape deck. By the time I finished my degrees, I was well and truly discovering the unsurpassed beauty of Quad, Radford and Leak valve amps, Spendor and Quad speakers, SPU cartridges and sprung suspension turntables including the Ariston RD11 and Linn LP12. The newspaper job followed a short time after teaching Politics and English to Years 11 and 12 students; and stints in a couple of hi-end hifi stores. After I retired from the newspaper, I spent a couple of productive years as the CEO of The Australian Hi-Fi Association. More recently, I became the audio editor for Stereonet. These days I work as the national A/V Editor for a Sydney-based media company called 4Square Media. Throughout my obsession with audio, my amused non-audiophile friends keep asking me why I beaver away fine-tuning assorted cables, racks and equipment. I keep telling them the same thing I tell any non-audiophile: "Friend, the equipment isn't the point of it all, music is." It sounds like and is such a pompous cliché, because it is to any non-audio veteran. Hearing Joni Mitchell, early Dylan, Van Morrison or the late Beethoven string quartets on a boom box is good enough for them. Or so they'll tell you with a certain amount of benevolent malice. The good-natured hectoring of assorted relatives and close friends is a byproduct of being an audiophile. Like politicians, it's something to be endured with as much good humour as one can muster. Still, the reoccurring question "why?" ought to lead to an exploration of our audiophile credentials. Why indeed do we do the things we do for the sake of this glorious hobby of ours? Seen from a distance, we must all seem slightly addled. The question was asked another time. My polite inquisitor happened to be the deeply talented Melbourne Herald Sun's music reviewer and fellow journalist, Nui Te Koha. "What does audio equipment do for your experience of music", he asked? Indeed. What is the defining relationship between music and audio equipment, for me? Instead of my well-rehearsed five-minute justification of Peter Walker, Arthur Radford and Saul Marantz's place in the pantheon of all that's holy and good in the history of 'great' hifi, I found myself mumbling the word illumination. Illumination. The intensity of light falling at a given place on a lighted surface. The concept that must have been gestating in my subconscious for years was finally out in the light so to speak. A hardly surprising fact given all my academic studies in one way or another led to post-modern linguistic theories. Back then, we were so busy deconstructing everything including our notions of the self, we disappeared metaphorically, speaking up our own collective backside. For me, illumination isn't an audio-quality engaging questions of detail retrieval, transparency, imaging, timing and all the other audio desirables we delight in and celebrate as audiophiles. Illumination is a concept primarily defining an experience; an experience that can be engendered looking at a sunset, a painting, a sculpture or—as the poet Wallace Stevens explained—the poetry of a breeze gently moving a woman's dress. More I cannot tell you about this intensely aesthetic experience. But I know it exists for me with the right equipment, the right music and the right occasion. And it's open to all music lovers with or without decent hifi systems. Those of us who have great-sounding systems get an open invitation to the experience of illumination every time we flick on the power switch. A synergistic music system is an open invitation to suspend time, the imagination, lose our sense of self and open the door to avenues of beauty that the rational mind struggles to comprehend after the event. The process is not a lot different to reviewing equipment because the more we engage with the music, the more our critical faculties retreat. So we're left with the question: Illumination. What does it really involve? I don't know. I know it's as real as a sunset, flower petals and moon shade. And, Van Morrison uses the expression "into the music...". 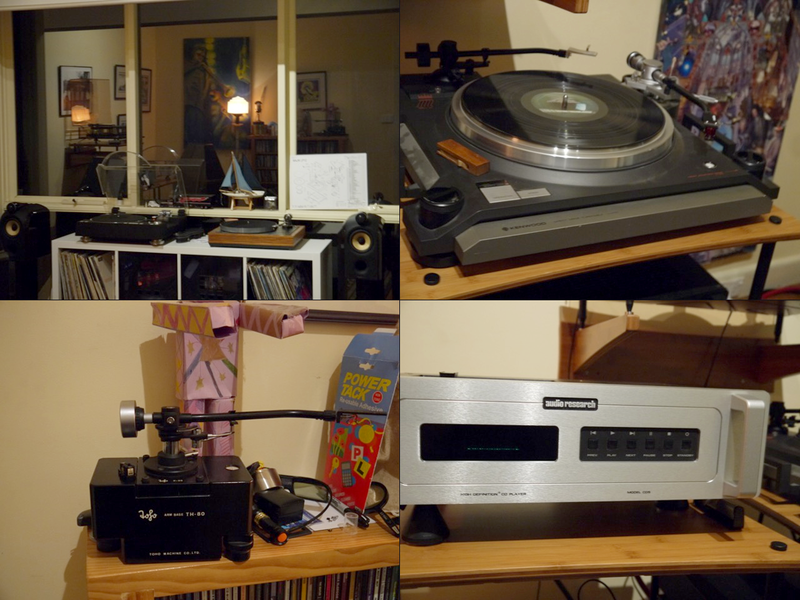 These days I get into the music with the following assortment of relatively sanely priced equipment which is quite capable of providing regular illuminative music sessions. Room: This is a rectangle of 12 x 14 feet with 13 feet ceiling. It's small and not ideal acoustically but over the years I've got to know how to treat its acoustic foibles well. Floor is hardwood covered by a rug. The room has its own separate electricity spur that runs to a dedicated circuit breaker at the main switchboard. Cable running from the room to the mains board is via a single hospital-grade power point. Composition is solid-core, 20 gauge 99.9% pure Australian copper. In our area, power purity is a pain in the arse as it is in most cities. Energy companies don't care about, nor can they control, the amount of garbage which feeds into the electricity grid. Crap power in my room is more noticeable with compact speakers. There it manifests as grainy treble, torn midrange and anaemic bass. I've traveled overseas extensively, listening to systems from Siberia to Seattle. Just about everyone has a mains power issue but most blame the equipment and continue to upgrade. Assorted power conditioners rob my system of dynamics so I don't bother and simply wait for the right conditions before reviewing.